They could not find it, so the four of us went on a mission digging in the bed and found it! Yesterday, Anes was telling us about his loose tooth and that his mom will be happy when it falls out. "Mom will be happy," he is still repeating! 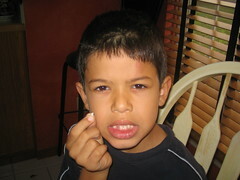 Anes' parents: notify the tooth fairy!